The Defender is anchored outside Reef HQ and the Museum of Tropical Queensland on Ross River, in Townsville, and it’s story is both inspiring and upsetting. WHAT IS THE TALL SHIP DEFENDER? This 115ft ship was built of Australian timber in 1896 by George Frost, who built 22 vessels. The Tall Ship Defender was built to do trading between the states and new growing colonies in Australia. It spent most of its time spent sailing the waters around Southern Australia, between Victoria and Tasmania. The ship was first registered in Launceston, Tasmania, where it earned a reputation for speed; having been entered into the history books in November 1923 by making a record breaking crossing of Bass Strait in less than 24 hours. The Australian Navy used the Tall Ship Defender during World War II to transport troops and supplies. After the war it was returned to Tasmania where she was left to ruin. A public appeal for its restoration raised about $250,000 and, along with federal Bi-Centennial funding, the 115ft Defender was restored between 1982 and 1988. It was then classified by the National Trust of Australia in 1986, and in 199 participated in the Bi-Centenary re-enactment of the sailing of the First Fleet into Sydney Harbour. 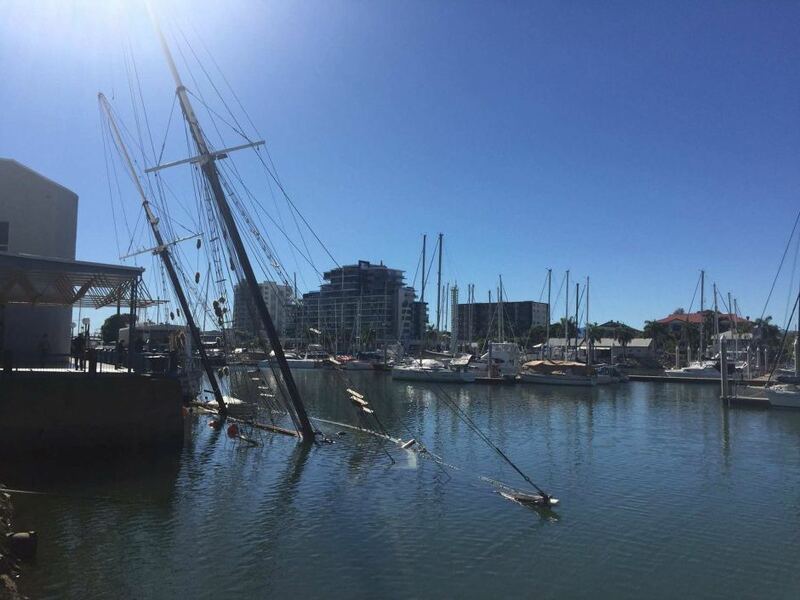 The former trading vessel that once serviced the early colonies of south-eastern Australia, and spent its post-restoration years as a Whitsundays pleasure charter cruiser, has spent the past 8 years falling to pieces in Townsville’s Ross River after being deemed unseaworthy following an engine room fire. After a second breath of life, the historic vessel has again fallen into ruin… and now it has been allegedly tampered with and sits at the bottom of the river. UPDATE 14 DEC 16 – The salvage of the Defender has finally begun. It is estimated to take up to 3 weeks. Let’s hope she is rescued by someone with a love of history! Amazing. I was part of the team that restored this vessel after its Bi cententury restoration and prior to its period working in the Whitsundays. Around 2004/2005 maybe. I then worked on her as the First Mate for some time. Prior to working in the Whitsundays it was rotting in the river in Townsville, completely unseaworthy. We spent months rebuilding and restoring it to make it seaworthy enough to sail again. It is a beautiful ship, a greyhound of the gaff riggers, a pleasure to sail. It is sad to hear she is again rotting and forgotten. Although, she has been bought back from the dead a few times, maybe the old girl will sail again. Thank you for the lovely memories. Hey Kate! That is awesome.. I would have loved to see her in her hayday! It is so sad the history can rot away without anyone noticing. Let’s hope the Ross River will not become her grave! I seen defender last time i was in Townsville . Its so sad i remember its glory days in the Whitsundays. I never had the pleasure of working on it but when Defender sailed into a bay the guests on every other boat stopped and looked. I really hoped someone would come along and restore her after the engine room fire .